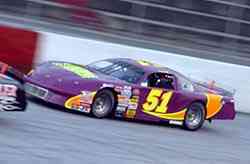 Jeff Fultz has had Greenville-Pickens Speedway covered when it came to the NASCAR Southeast Series. 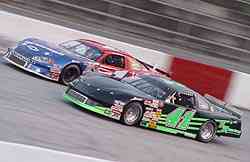 Coming into the event at Greenville, he has earned four straight wins at the legendary track in SES competition. That all came to an end this time though, thanks to one left rear flat. “The car was hooked up tonight,” said Fultz of his run at Greenville. “We had a real good car. We cut the left rear down for some reason. We came in and took our tires and our car was still pretty good. Fultz didn’t get together with anyone to get the flat. In fact, he wasn’t sure what happened. “There was no contact. I was cleaning the tires and I felt it and told the guys I might have a flat tire. I started cleaning the tires and I felt the skirt drag. It was fortunate that we felt it under the caution. 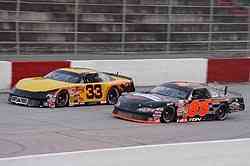 Back in the Southeast Series opener, Justin Wakefield finished second to Jeff Fultz. It was yet another second-place run for the Georgia youngster. This time around, he did it yet again. Wakefield was right there with Norris at the end, but had to settle for second. Greenville is known for being a tough track. So why has Wakefield done so well at the track, with two-straight second place finishes at the tricky half-mile? Wakefield has had a great year thus far. He’s currently seventh in the point standings, but only 100 points out of the point lead. A big part of that has been the help of crew chief Jody Ridley. NASCAR Southeast Series driver Chris Davidson sat at the back of his hauler after Saturday night’s Southeast Series race at Greenville-Pickens just shaking his head. It wasn’t a look of puzzlement. It wasn’t a look of frustration. It wasn’t a look of outright joy either. Instead, Davidson sat there with a look of contentment on his face. Why? Because in a year that has been so rough for Davidson and his Turner Motorsports team, he was more than satisfied to be looking at his #41 ride in one piece after completing all 150 laps and earning him his second top-10 finish of the season. “A top-10 run isn’t exactly what we wanted, but it is better than tearing the car up. This is still our Achilles heal, no matter how we look at it,” said Davidson. The season has been a tough one for the Southeast Series second-year driver. He has failed to finish all but the two Greenville races, despite having fast cars almost everywhere the series has visited. Accidents and mechanical problems have plagued the team and Saturday night it looked like it may bite them once again. “Things were looking a little bad for us before the start of the event. We noticed that the left-rear tire was losing pressure. But we couldn’t change it on the grid after talking to the NASCAR officials, so we decided to just ride it out and hope that the tire would stay together for us. “We came in and got our tire, but we’d already lost so much track position. We were just battling from the back all night long. The motor broke a valve spring there at the end, but the car was still rolling with all four tires and it was doing well at the end. 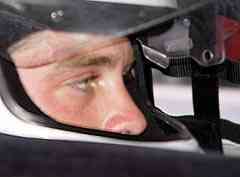 We kept the car in one piece and got out of Greenville, so I guess we are happy,” added Davidson, who finished ninth. A turnaround for Davidson might be attributed to the Turner Motorsports team running a second car in the last couple of races with fellow Texas driver Casey Smith behind the wheel. The team has been able to share testing and practice notes, which helped in Greenville. Chris Davidson (#41) finally got a top-10 run. that we race on so he can tell me where every bump is and every angle I need to take. Jody has been huge for me because he knows the exact line I need to be running because he’s got so much experience at all the tracks the Southeast Series competes at. Smith finished eighth in his second race with the Turner Motorsports team, one spot ahead of Davidson. 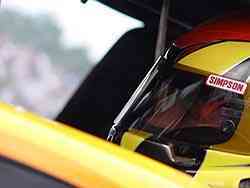 “The car was the worst it was all weekend long during the race,” said Smith. “During the day, the car was awesome. After the rain though and washing all of the rubber away, the car was just loose, loose, loose. “We came in the first stop and closed the stagger and pulled a spring rubber out, but I just couldn’t get it to pass. Anytime I tried to get underneath someone, I could get under them, but I couldn’t pass because it would turn good, it just didn’t have any traction. I could get through the center of the corner better than anyone, but I was getting killed off the corner. For some reason, it was missing too. As of now, the team plans to run Smith at all of the remaining short track events in a team car. Like always at Greenville-Pickens Speedway, the Southeast Series’ teams were forced to make a pit stop. It is something the teams have always been forced to do at the track. This time around though, the SES cars had to change a tire during their stop. In the past, they’d just had to come in and stop. This time around, they had to change a tire. Not two tires, or not even four, but just one. Casey Smith's #51 has been a big help to Davidson already. Gary Helton stayed out early in the event at Greenville when most of the other leaders decided to pit. It worked for Helton, as he got to lead 41 laps, but since he had to come in later to make his stop, it cost him a chance at the win in the end. “We thought we could ride it out,” said Hetlon, who is dominating the Rookie of the Year points in the Southeast Series division. “I thought everyone would come in and get tires early, which they did. JR was pretty good. Fultz is always good. It didn’t match his third-place finish at Greenville from earlier this year, but Jason Hogan’s fifth-place run kept him in the running for the Southeast Series points championship. Gary Helton (#86) started on the pole and led a bunch of laps, but pit strategy hurt him. “I had to get up on the wheel and drive,” said Hogan. “We had a good car during practice. I don’ know if the rain changed the race track. But when the race started, the car was bad loose. I had to battle all night because of it. It wasn’t just a regular, boring race for Hogan. He was on the receiving end of a couple of big bumps from Justin Wakefield and Dusty Williams. After Greenville, Robert Richardson’s mind was on his ARCA RE/MAX Series event at Michigan International Speedway. But his emotions were a little mixed. Richardson was satisfied with his 10th-place finish, but then again, he wasn’t overly happy. Richardson had a solid car and started on the outside pole on Saturday night, but fell back quickly after some mechanical problems put the team behind early. “I was a little worried to start on the outside of the front row too, because we had had a bunch of rain and there was going to be no rubber up high,” said Richardson. “I was a little worried that I was going to get freigh-trained and put to the back, but I was actually able to get down and into second early. At the beginning of the race, though, we lost our brakes. We gradually got them back, but by then, we were already at the tail-end of the pack and the leaders were catching us. Once we got our brakes back, we started working back toward the front, but we were already so far behind. “As fast as those leaders were, we got put down a lap early and we just couldn’t seem to get it back, no matter how hard we tried. JR (Norris) had a bad fast car and this is a tough track to try and make up a lap on. It is just unfortunate. Dusty Williams started out the year strong. He’s still been running strong. He is second in the standings, but he’s still chasing JR Norris. “After that wreck in Nashville there is something in the rear end that just isn’t right and it was hurting us here tonight,” said Williams. “The car was that way in Caraway too. We need to figure it out. The #92 team goes to work on Hogan's car.